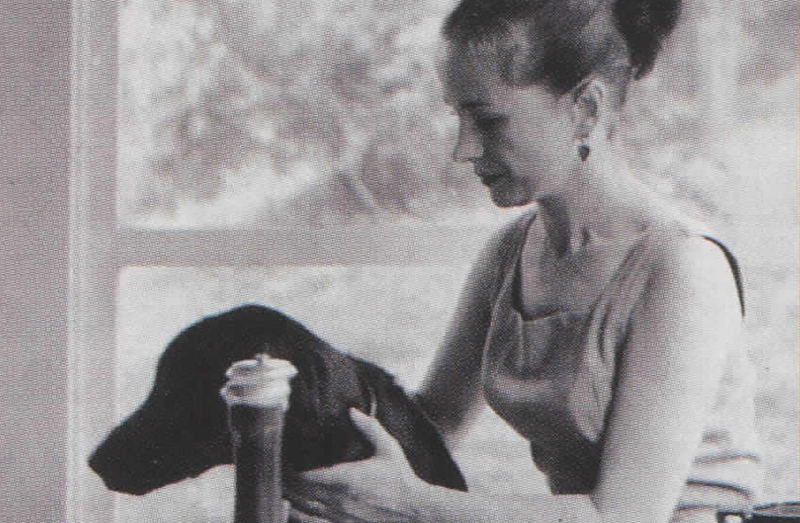 Maeve with her beloved labrador, Bluebell, in East Hampton, New York in 1962. In her new biography of Maeve Brennan, Angela Bourke includes two photographs taken around 1948. In one, Brennan, a delicate-looking young woman dressed in black, is sitting in front of the fire looking over her shoulder, a cigarette in her left hand. With her hair fixed tightly in a bun and her lips pursed, she looks like a fashion model. But who was Maeve Brennan herself? And how did this child of Irish revolutionaries come to be a staff writer at The New Yorker for decades, turning out stories that Irish critic Fintan O’Toole has said were “suffused with utter conviction and realized with absolute emotional precision,” without ever gaining recognition? Maeve Brennan was born in Dublin on January 6, 1917, while her father, Robert, was in an English prison serving time for his part in the Easter Rising. During the Irish Civil War, Maeve and her siblings were often sent to stay with relatives in Wexford, while Robert, a de Valera supporter, used sleephouses to avoid arrest by Michael Collins’ Free Staters. Despite these trials, Maeve’s childhood was essentially happy. She attended secondary school at Scoil Bhrighde, an Irish-speaking school run by Louise Gavan Duffy, daughter of Irish rebel Charles Gavan Duffy. In December, 1933, de Valera appointed Robert Brennan Secretary of the Irish Legation in Washington, D.C. and months later the family followed. In Washington, Maeve earned a B.A. from American University and studied library science at Catholic University. She was also writing short stories, and even a novella, The Visitor, which was not published until 2001, after editor Christopher Carduff uncovered it in the University of Notre Dame archives. The Visitor, as Carduff has said, struck three notes that continued in all of Brennan’s future works, “a ravenous grudge, a ravenous nostalgia, and a ravenous need for love.” The novella follows an orphaned young woman who returns from France to live with her cold, unwelcoming grandmother in Dublin. In 1949, Brennan became a staff writer at The New Yorker, first contributing unsigned pieces on fashion or “Talk of the Town” pieces from a character she called The Long-Winded Lady.” These pieces brought to life scenes unfolding on the streets or ruminations from her various apartments and hotel rooms (always described as “where I am living at present” or “at the moment”) in Greenwich Village and the Times Square area. Her first published story, “The Poor Men and Women,” appeared in the April 1952 issue of Harper’s Bazaar. After that, all her published stories appeared in The New Yorker. Most of Brennan’s stories are set in Dublin, in a house like her family’s home on Cherryfield Avenue in Ranelagh. Some, including the acclaimed “The Springs of Affection,” concern Delia and Martin Bagot, a couple very similar to Brennan’s parents. Maeve herself appears as their daughter, Lily. Indeed, Bourke’s biography reports that some of Maeve’s relatives were disappointed with these less than positive accounts of their lives. Another group of stories follow Hubert and Rose Derdon, an aging couple whose son is a priest. Although her stories were well-received, Maeve Brennan didn’t become a published book author until 1969, when a collection of short stories was released, soon followed by a collection of her Long-Winded Lady pieces. However, she was not a publishing success. The books were not released in Ireland, but The New Yorker was read there. Bourke claims that the changes Ireland was going through in the 1960’s made people reluctant to dwell on the past, and may explain a lack of interest in Brennan. Early in 1954, Brennan married her colleague St. Clair McKelway. Her editor William Maxwell referred to the match as “not something you could be hopeful about.” It was McKelway’s fourth marriage, and while he was by all accounts very charismatic, he was also an alcoholic and usually in debt. The couple divorced five years later, and Brennan resumed her pattern of temporary accommodation. As William Maxwell says in his introduction to Brennan’s 1997 collection of stories, The Springs of Affection, “She had begun to have psychotic episodes, and she settled down in the ladies’ room at The New Yorker as if it were her only home…. During the last decade of her life she moved in and out of reality in a way that was heartbreaking to watch and that only hospitals could deal with.” After some years of wandering, Brennan was admitted to a nursing home, where she died on November 1, 1993, aged seventy-six. A Long-Winded Lady piece from 1955 describes a middle-aged woman who makes a scene during evening rush-hour in Manhattan, slamming her umbrella in front of a taxi and singing loudly. Brennan’s sympathy for the woman is almost prescient, considering that Brennan eventually lost her memory and became, to all intents and purposes, helpless in public. Maxwell has said, “I don’t know whether in Ireland she is considered an Irish writer or an American. In fact, she is both, and both countries ought to be proud to claim her.” Hopefully, Angela Bourke’s biography will help restore and keep alive Maeve Brennan’s claim. What attracted you to Maeve Brennan’s story? The Springs of Affection came out at the end of 1997 and almost simultaneously an article came out in the Irish Times by Fintan O’Toole about her. The stories were wonderfully written, subtly understated and so exacting in the ways that people deal with each other. I started asking people about her, and there seemed to be a growing interest, almost a passionate movement of individuals who had discovered her. What was the hardest part of writing this biography? Getting it done on time, doing it at a certain speed. A lot of people who had known her were in their eighties, and some have died since I interviewed them, so there was a sense that this book had to come out soon. And if people are going to read the books in college courses, there has to be some body of critical material. The homeless years must have been difficult to research. I trawled through her letters to Bill Maxwell. I kept rereading and cross-referencing them and finding information to corroborate facts. It’s possible that somebody else will find out more if they could get access to medical records or even police records, but that wasn’t really part of my research. I didn’t want to devote several chapters to her coming apart. It was a cultural biography of her writing, so when the writing stops, it seems a little prurient to poke too much into her personal life or to damage her memory. Would Maeve have become a writer if she had remained in Ireland? Almost certainly she couldn’t have had that kind of career in Ireland. Probably she would have married and stayed married. She might have had four or five or six kids and probably would have been working hard just keeping the domestic set-up going. She might have written for the Irish Times. Her novella, The Visitor, would almost certainly have been banned if it had come out in the ’40s. Her life might have been very difficult. America in the ’50s was in a boom. There was almost a giddy prosperity, but Ireland was very poor. Would her life have been different if her work had been recognized more? No. Had she wanted to be a famous writer, she definitely had all those contacts. She was very glamorous, but she was someone who left parties early. She’d go to stay with friends and suddenly pack her bags and leave. Having to turn up at literary lunches wouldn’t have interested her. She wrote for Bill Maxwell and The New Yorker. She didn’t care about being on bestseller lists. Do you think the current renewal of interest in Brennan will continue?